SEO is juuuuust loving this post title. Ask me about my keyword optimization skills!! No, seriously, ask me about them. I’ve dedicated a paragraph to them on my CV. 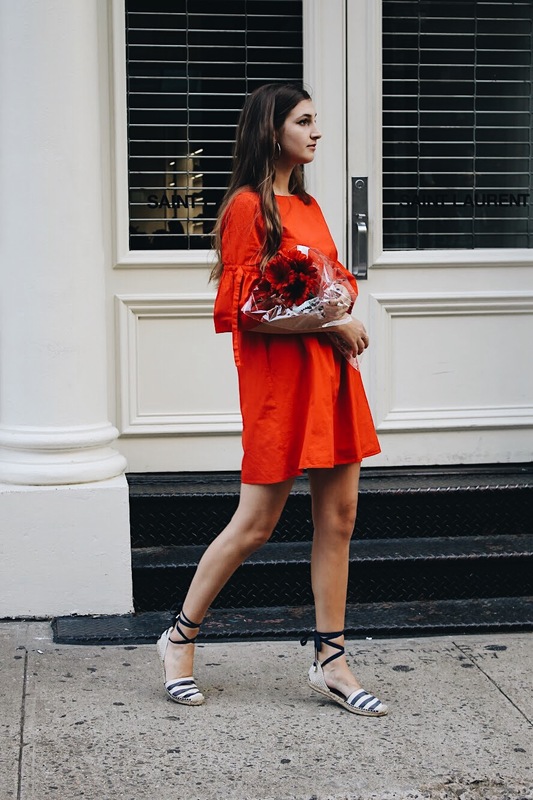 A few months ago, I came across this beautiful lil red dress from Mango by way of Instagram. 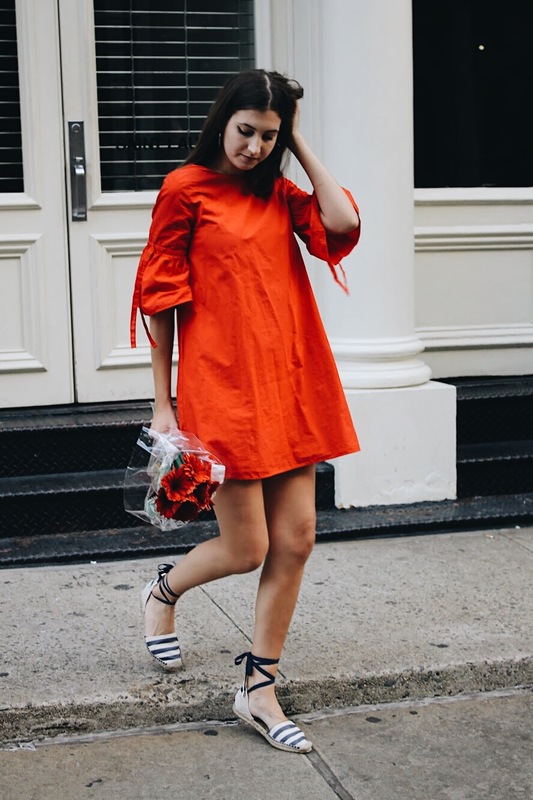 It was linen, it had ruffled sleeves, and I was pretty positive it was the most perfect creation on this earth aside from Emma Thompson (and maybe the white cheddar mac n cheese from Trader Joe’s). But the one dent in my master plan to wear it every ensuing day of my life was the price. It was $60 which isn’t a lot in the grand scheme of things but is a lot when you’re the type of person who waits until the ramen is two-for-one at Duane Reade. So I waited. I stalked that dress for so long and with such ferocity it should probably have taken out a restraining order against me. Unfortunately, the sale never came—though as my luck would have it, it’s actually discounted right now for $30 and I am peeved—so I started to look for suitable substitutes. I found one at Zara (pictured here) that fit the requirements of being a) red and b) a dress. It’s not linen but it does have funky sleeves, and that’s good enough for me. I have styled it in truly groundbreaking fashion with some espadrilles that my brother picked out for me for my birthday (by “picked out for me” I mean “picked up off the ground” after I instructed him I wanted them and shoved them in his general direction; by “for my birthday” I mean “four months after my birthday” because my family seldom does anything in a timely manner) (just kidding Ethan I love them a lot) and some red flowers. Because HAVEN’T you heard??? Flowers are the new straw bag. The finished product makes me look like my name is Marie and I’m about to head to the farmer’s market to peruse the free range gooseberries and/or teach you how to DIY a pillow using only some baker’s twine and modge podge. I’m into it. 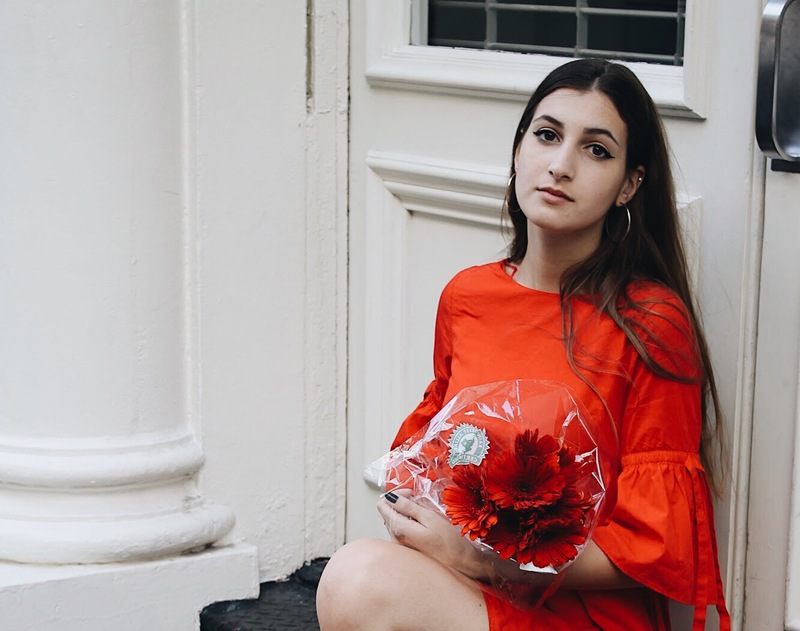 Because tbh I’ve always wanted to be the type of person who perches in the doorways of Soho clutching flowers and gazing wistfully into your soul, as if from a photograph in an art museum of a young woman during the 40s entitled “When Will My Husband Return From War?”. That color red is so stunning! I’m so happy I just discovered your blog! You look fabulous and I love your fun writing style. Rock on!! Love this dress! This is the cutest street for photos! 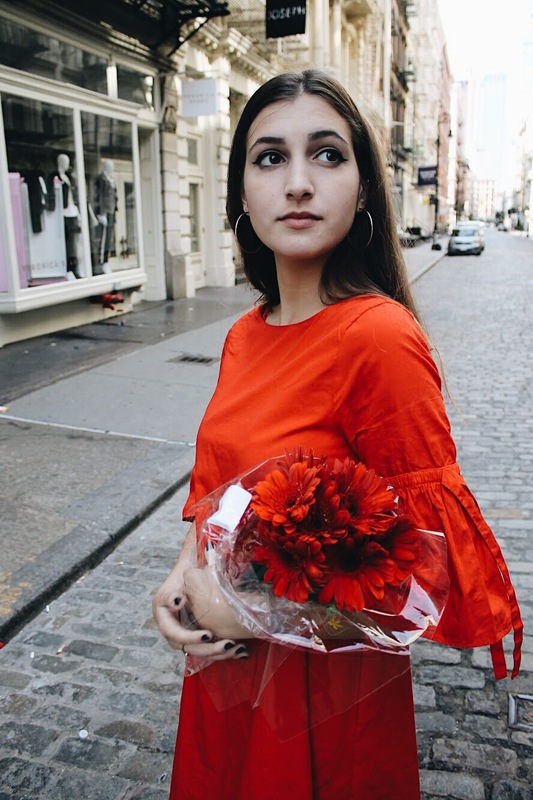 First of all, this outfit is totally adorable and the color red looks amazing on you. Secondly, this is my first time ever visiting your blog & I love how you write-it’s totally relatable and fun to read! I just love this outfit on you! Such a great dress! You look beautiful! That dress is so dang cute! 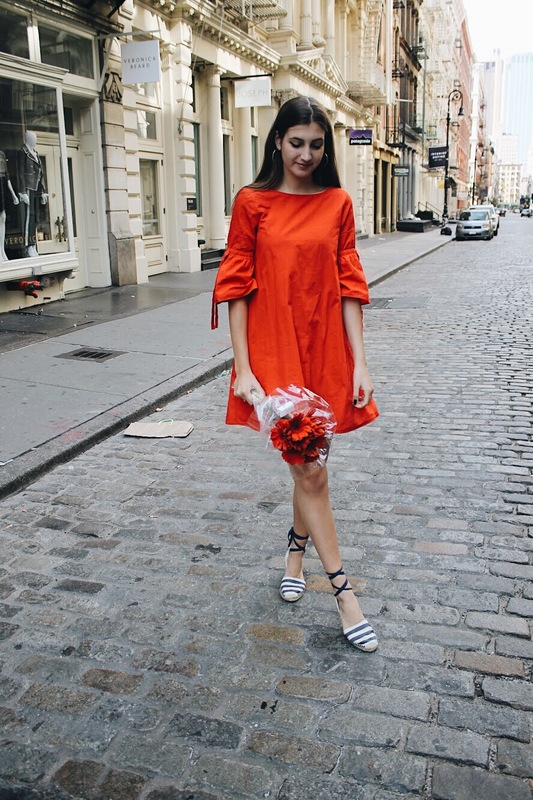 The striped shoes and bright red dress make for the perfect duo. Love your style girl! I love your dress and shoes so much! You styled this so well! Red is totally your color! I also love those sassy striped shoes! Hahah, I love this look and your post title! So sassy and this color looks amazing on you! This dress is soso cute and PERFECT with those shoes! It’s like the shoes and dress were made for each other! Love it! Love it, this is such a fun post! And honestly I think I like the dress you are wearing SO much more!!! I absolutely love the color red on you and this dress!! Love the color and style of this dress! That one picture nails the “waiting for my husband to come back from war” thing haha. I love this dress! The color is awesome! I love the color of that dress. Perfect for fall!